Bay Lake Tower is Walt Disney World's newest Disney Vacation Club property and has perhaps the best location of them all. Attached to the iconic Contemporary Resort via an aerial walkway, the Bay Lake Tower guest gets all the advantages of that resort plus access to a rooftop observation deck offering the best views of the Magic Kingom and its fireworks shows. Room Rates: All units are equivalent to two-bedroom villas at other DVC properties. See the official Disney page for Animal Kingdom Villas for current room rates. Room Service: Yes, available 24 hours. Internet: Wired in-room ethernet port. $9.95 for 24-hours. Free for DVC members staying on points. Laundry: A free laundry room is on the first floor of the towel. Dry cleaning services are available from your room for a fee. Pools and Swimming: In addition to Bay Lake Pool in the main Contemporary Resort area, Bay Lake Tower guests also have exclusive access to the Bay Cove Pool, which has its own slide, children's water play area, and poolside snack bar. Gym and Exercise: The Olympiad Fitness Center is located on the third floor of the Contemporary Tower, serving both resorts, and is open from 6:30 a.m. to 7:00 p.m. Personal trainers are available for a fee and by appointment. On foot: Walking to Magic Kingdom is allowed, but be sure to stick to the designated route. Bus: There is no separate bus stop for Bay Lake Towers, guests will need to use the common bus stop for the Contemporary Resort. Busses provide direct access to Disney's Hollywood Studios, Animal Kingdom, the two water parks, and Downtown Disney. Other locations can be reached by going to one of the parks or Downtown Disney and transferring to a different bus. 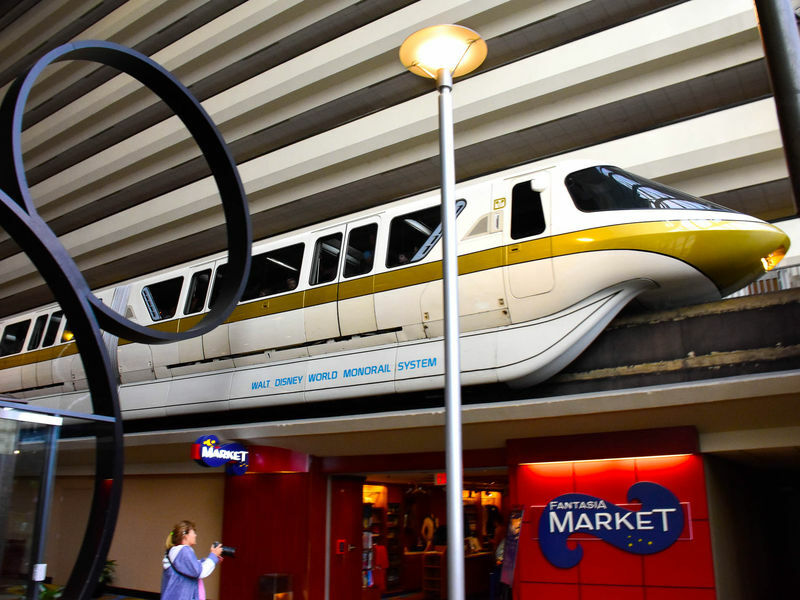 Monorail: The monorail station is located on the concourse level of the Contemporary Resort tower and provides access to Magic Kingdom, Grand Floridian Hotel, Polynesian Resort, and the Ticket & Transportation Center (TTC). At the TTC, you can transfer to the Epcot monorail. Ferries: A launch travels between the Contemporary Resort and Fort Wilderness. Other dining — At Bay Lake Tower, Cove Bar provides light food and a full bar for guests enjoying the Bay Cove Pool. Up on the top floor of the tower, exclusively for Disney Vacation Club members (or guests of such) is the Top of the World Lounge, a full service bar with an observation lounge providing the best view of the Magic Kingdom and fireworks shows. Quick food options in the Contemporary Tower include Contempo Cafe, a late night quick food option with standard grill foods available until midnight, and Contemporary Grounds with all the normal coffee drink options. Shuffleboard, tennis, volleyball, and bocce ball courts are all available for guest use. Community Hall inside Bay Lake Tower offers indoor games like ping pong, foosball or just hanging out watching TV. The Contemporary Resort area also has its own beach area and the marina offers watercraft rentals of various types. In the evening the Electrical Water Pageant puts on an after dark show featuring barges decorated with lights and cruising by on Bay Lake.